یکی از مسائل مهم در مدیریت منابع آب، مسئله قیمت تمام شده آب است. عوامل مؤثر بر قیمت آب را می‌توان به چهار بخش توزیع آب؛ خرید، تأمین و استحصال آب؛ تصفیه و گندزدایی و نگهداری تأسیسات و تجهیزات آب تقسیم نمود. هر یک از این چهار بخش به متغیرهای جزئی‌تری تقسیم می‌شوند. در این پژوهش متغیرهای مؤثر بر این چهار بخش شناسایی و با استفاه از روش تحلیل عاملی اولویت‌بندی شدند. متغیرهای هر چهار بخش در دو عامل دسته‌بندی شدند. در بخش توزیع آب عامل اول شامل متغیرهای هزینه حمل و نقل، اجاره ماشین‌آلات، استهلاک ساختمان و استهلاک ماشین‌آلات و تجهیزات تولید، و عامل دوم شامل متغیرهای استهلاک وسائط نقلیه تولید و تعمیر و نگهداری دارایی‌های ثابت تولید می‌باشند. 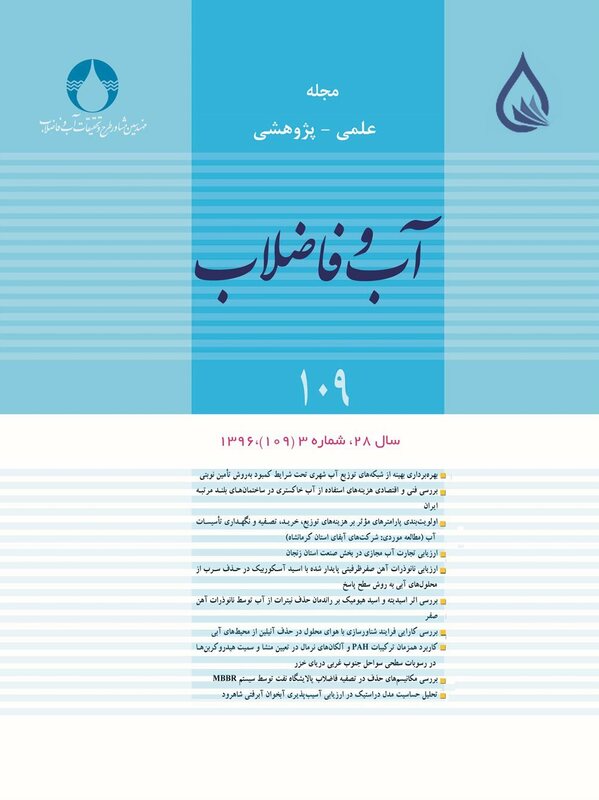 در بخش تصفیه عامل اول شامل متغیرهای استهلاک تأسیسات، توزیع و فروش حقوق آبدار، گندزدا، استهلاک ماشین‌آلات و تجهیزات تولید و استهلاک ساختمان و عامل دوم شامل متغیر اجاره ماشین‌آلات است. در بخش خرید عامل اول شامل متغیرهای استهلاک ماشین‌آلات و تجهیزات تولید، آب خریداری شده، اجاره ماشین‌آلات، هزینه حمل و نقل و استهلاک وسائط نقلیه تولید و در عامل دوم متغیر استهلاک ساختمان قرار دارند. در بخش نگهداری تأسیسات در عامل اول متغیرهای استهلاک ماشین‌آلات و تجهیزات تولید، استهلاک وسایط نقلیه تولید، استهلاک ساختمان و هزینه نگهداری توسط آبدار و در عامل دوم متغیرهای استهلاک سایر دارایی‌ها، اجاره ماشین‌آلات، توزیع و فروش حقوق آبدار قرار دارند. An important consideration in water resources management is the total cost of the water supplied to customers. The factors involved in water supply costs are divided into the four main components of water distribution; purchase, supply, and harvest; treatment and disinfection; and facility running and maintenance costs, each of which comprises individual parameters. In this study, the parameters in the four components are investigated and prioritized using the factor analysis method. Results show that the parameters in each componet may be coalesced into two main factors. In the water distribution component, transportation, machinary rental, building depreciation, and machinery and equipment depreciation costs may be considered as one factor while vehicle depreciation and maintenance costs as well as the costs of fixed assets account for the second factor. The treatment component involves facility depreciation, labor, materials (disinfectants), equipment depreciaion, and building depreciation costs as the first factor while machinary rental cost forms its second factor. In the purchase component, machinery and equipment depreciation, water purchase, transportation, machinary rental, and vehicle depreciation costs form one factor while building depreciation costs form the second factor. The water facility component comprises one factor that includes machinery and production equipment depreciation, vehicle depreciation, building depreciation, and labor costs and its second factor includes asset depreciation, machinary rental, and labor costs. Abdi, H., 2003, Multivariate analysis, Encyclopedia for Research Methods for the Social Sciences., Thousand Oaks, 699-702. Dandy, G.C., Mcbean, E.A. & Hutchinson, B.G., 1984, "A model for constrained optimum water pricing and capacity expansion", Water Resources Research, 20(5), 511-520. Espey, M., Espey, J., and Shaw, W.D., 1997, "Price elasticity of residential demand for water: A meta‐analysis", Water Resources Research, 33(6), 1369-1374. Goldaste, A., Asghari, R. & Torabi, M., 1998, SPSS / Win User Guide, Publishers Hami, Tehran. Heise, B., Bobertz, B. & Harff, J., 2010, "Classification of the Pearl River Estuary via principal component analysis and regionalization", Journal of Coastal Research, 26(4), 769-779. Mashayekhi, A.N., Toloie Eshlaghy, A., Rajabzadeh, A. & Razavian, M., 2011, "Determination contsructs validity of an agile organization model by using factor analysis", Journal of Industrial Engineering International, 7(14), 75-89. Nasri, M. & Najafi, A., 2009, "Factors in the flood basin of Sirjan to the analysis method", Journal of Geography and Environmental Planning, 36(4), 101-118. Oppenheim, N., 1980, Applied models in urban and regional analysis, Prentice-Hall, Inc., USA. Ragno, G., De Luca, M. & Ioele, G., 2007, "An application of cluster analysis and multivariate classification methods to spring water monitoring data", Microchemical Journal, 87(2), 119-127. Roth, E., 2001, Water pricing in the EU: A review, European Environment Bureau, Brussels. Sadeghi, T., Ehsanpour, K. & Sedaghat, R., 2013, "Combining application of factor analysis and SWOT to survey marketing and advertisement: A case study of pistachio in Kerman province", Journal of Nuts., 4(4), 33-46. Taghvaei, M. & Shafyei, P., 2010, "The application of factor analysis and cluster 1-spatial evaluation rural areas", Journal of Agricultural Economics and Development, 68(17), 57-76. Talebi, H. & Zangi Abadi, A., 2002, "Analysis to determine the factors in human development indices and major cities", Geographical Research Quarterly, 60(16), 124-142. Williams, B., Onsman, A. & Brown, T., 2010, "Exploratory factor analysis: A five-step guide for novices", Journal of Emergency Primary Health Care, 8(3), 1-12. Wunesch Karl, L., 2005, "Principal components analysis – SPSS", East Carolina University, Departmant of Psychology. Yidana, S.M., Ophori, D. & Banoeng-Yakubo, B., 2008, "A multivariate statistical analysis of surface water chemistry data—The Ankobra Basin, Ghana", Journal of Environmental Management, 86(1), 80-87.